Background Expiratory flow limitation and lung hyperinflation promote cardiocirculatory perturbations that might impair O2 delivery to locomotor muscles in patients with chronic obstructive pulmonary disease (COPD). The hypothesis that decreases in lung hyperinflation after the inhalation of bronchodilators would improve skeletal muscle oxygenation during exercise was tested. Methods Twelve non- or mildly hypoxaemic males (forced expiratory volume in 1 s (FEV1)=38.5±12.9% predicted; Pao2>60 mm Hg) underwent constant work rate cycle ergometer exercise tests (70–80% peak) to the limit of tolerance (Tlim) after inhaled bronchodilators (salbutamol plus ipratropium) or placebo. Muscle (de)oxygenation (∼fractional O2 extraction) was determined in the vastus lateralis by changes (Δ) in the deoxyhaemoglobin/myoglobin signal ([HHb]) from near-infrared spectroscopy, and cardiac output (QT) was monitored by impedance cardiography. Results Bronchodilators reduced lung hyperinflation and increased Tlim compared with placebo (454±131 s vs 321±140 s, respectively; p<0.05). On-exercise kinetics of QT and pulmonary O2 uptake (V˙o2) were accelerated with active treatment; Δ[HHb] dynamics, however, were delayed by ∼78% and the signal amplitude diminished by ∼21% (p<0.01). Consequently, the ratio between V˙o2 and Δ[HHb] dynamics decreased, suggesting improved microvascular O2 delivery (τ-V˙o2/MRT-Δ[HHb]=4.48±1.57 s vs 2.08±1.15 s, p<0.05). Of note, reductions in lung hyperinflation were related to faster QT kinetics and larger decrements in τ-V˙o2/MRT-Δ[HHb] (p<0.01). Conclusions Decreases in operating lung volumes after the inhalation of bronchodilators are associated with faster ‘central’ cardiovascular adjustments to high-intensity exercise with beneficial consequences on muscle oxygenation in patients with moderate to severe COPD. In the present study, therefore, we aimed to investigate the effects of acute inhalation of a combination of a short-acting β2-adrenoceptor agonist (salbutamol sulfate) and a short-acting anticholinergic (ipratropium bromide) on key determinants of QO2 and V˙o2 during high-intensity, constant work rate cycling exercise in patients with moderate to severe COPD. Confirmation of the hypothesis that bronchodilators would slow the dynamics and decrease the amplitude of leg muscle deoxygenation would provide novel evidence that amelioration of the mechanical burden of breathing might positively impact upon the provision of O2 to the working peripheral muscles during exercise in patients with COPD. Twelve males with moderate to severe, stable COPD (forced expiratory volume in 1 s (FEV1)/forced vital capacity (FVC) <0.7 and postbronchodilator FEV1<60% predicted), and resting Pao2>60 mm Hg, volunteered to participate in the study. Patients were recruited from the COPD Outpatients Clinic of the Sao Paulo Hospital (Brazil), a University-based teaching hospital. Subjects were free of echo Doppler cardiographic evidence of severe pulmonary hypertension and left ventricular dysfunction. No patient has ever been enrolled in a pulmonary rehabilitation programme. All participants signed a written informed consent form. The study protocol was approved by the Institutional Medical Ethics Committee. This was a double-blinded, placebo-controlled crossover study. After determination of peak (V˙o2) on a maximal incremental cycle ergometer exercise test, subjects were randomly assigned to inhale salbutamol sulfate 120 μg plus ipratropium bromide 20 μg per actuation, via a metered dose inhaler (MDI; Combivent, Boehringer Ingelheim, Germany) or Combivent placebo via an MDI each on a different day. At these visits, patients performed a total of four transitions from baseline pedalling to 70–80% peak work rate. The initial test was performed to the limit of tolerance (Tlim, min) 20 min after the inhalation of bronchodilators or placebo. Patients rested for 1 h before performing an additional 4 min exercise test. Thus, there were two on-exercise repetitions per day. Data from same-day transitions were averaged to reduce data noise for the kinetic analyses (see details below). Additional details are described in the supplement available online. Skeletal muscle oxygenation profiles of the left vastus lateralis were evaluated with a commercially available NIRS system (Hamamatsu NIRO 200, Hamamatsu Photonics KK, Japan). The (deoxyhemoglobin (Hb)/myoglobin (Mb) signal ([HHb], μM/cm) during exercise has been considered a proxy of fractional O2 extraction in the microcirculation, reflecting the balance between O2 delivery and utilisation11 12—that is, Δ[HHb]≅V˙o2/QO2. Additional details are described in the supplement online. Cardiac output (QT, l/min) and stroke volume (SV, ml) were measured throughout the constant work rate test using impedance cardiography (PhysioFlow PF-0, Manatec Biomedical, Macheren, France).13 This methodology is different from previously used impedance systems as its algorithm does not require basal thoracic impedance measurement (Z0). Considering, however, the controversy on the accuracy of the system in providing reliable absolute values of SV in patients with COPD,14 15 exercise haemodynamic data were also expressed as ‘Δ’ from baseline. Additional information on response characteristics and system validation are detailed in the supplement online. where b and p refer to baseline unloaded cycling and primary component, respectively; A, TD and τ are the amplitude, time delay and time constant of the exponential response. For V˙o2 analysis we deleted the data relative to the first 20 s after exercise onset—that is, the cardiodynamic phase. 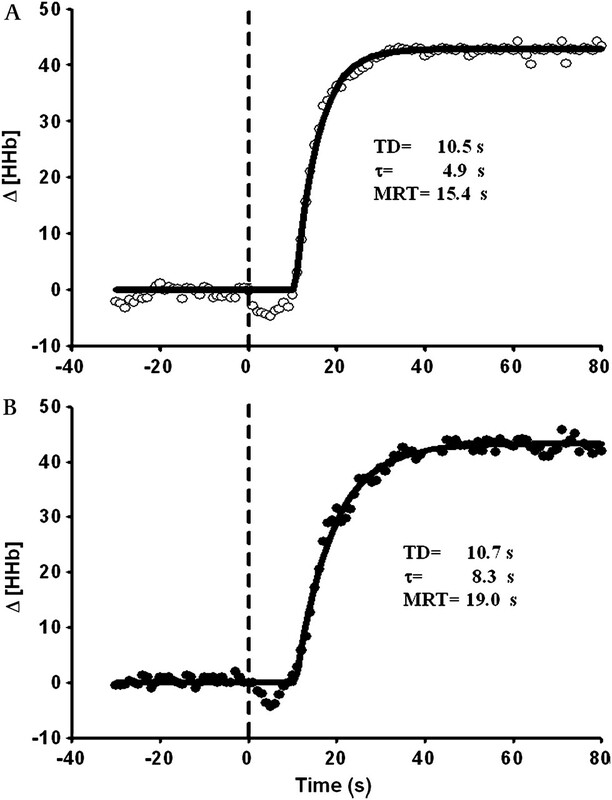 Therefore, τV˙o2 represents the time course of the primary component—an estimate of the muscle V˙o2 kinetics.17 The overall kinetics of [HHb] were determined by the mean response time (MRT=τ+TD). The ratio τ-V˙o2/MRT-[HHb] was used as a semiquantitative index of microvascular QO2 kinetics, with higher values indicating slower QO2.4 5 Based on our experience with NIRS in patients with COPD,4 5 18 and previous findings with other disease populations,19 we systematically examined whether there was an ‘overshoot’ in Δ[HHb] after the initial fast response (see the Results section). In the case of a discernible ‘overshoot’ in the two interventions, we used the area under the ‘overshoot’ as an additional index of impaired microvascular QO2.12 Additional information on kinetic analyses are detailed in the supplement online. Statistical analysis was performed using SPSS 15.0. We planned to evaluate 12 patients based on our previous results in a similar transversal and crossover study with heliox in patients with COPD.5 Paired t test was used to contrast within-subject exercise responses with the exception of symptom scores (Wilcoxon signed-rank test). A one-way repeated measures analysis of variance (ANOVA) was used to compare Δ[HHb] at quartiles of isotime—that is, the shortest Tlim between the two interventions on a given subject. Pearson product–moment correlation was used to assess the level of association between continuous variables. The level of statistical significance was set at p<0.05 for all tests. On average, patients had severe airflow obstruction and lung diffusing capacity for carbon monoxide (DLCO) impairment with increased static lung volumes and normal arterial blood gases at rest (table 1). All patients showed reduced maximal exercise capacity (peak V˙o2<83% predicted) (table 1)20 with increased peak V˙E/MVV ratio (>0.8). Although dyspnoea was the main limiting symptom in 8/12 patients, Borg scores for leg effort did not differ more than 2 units from the Borg dyspnoea ratings in these patients. Treatment with bronchodilators increased FEV1 and IC compared with placebo (1.30±0.50 litres vs 1.17±0.56 litres and 2.28±0.83 litres vs 1.89±0.73 litres, respectively; p<0.001 for both comparisons). The criteria for a ‘positive’ bronchodilator response (FEV1 change ≥12% and 200 ml)21 were obtained in 7/12 patients, with FEV1 increases being closely related to changes in FVC. The subjects exercised at 53±10 W. Exercise tolerance (Tlim) was improved after treatment with bronchodilators (321±140 s vs 454±131 s, for placebo and bronchodilators, respectively; p=0.01). Increases in pre-exercise IC were significantly related to Δ (bronchodilators–placebo) TLim (r=0.72 (95% CI 0.31 to 0.91); p=0.04). As previously described,13 increases in IC during exercise were accompanied by larger tidal and inspiratory reserve volumes and lower dyspnoea scores at isotime (table 2). In contrast, there were no significant effects of bronchodilators on mean Spo2 values (table 2), and improvements in Spo2 >3% at isotime were found in only 3/12 patients. Similarly, there were no significant between-interventions differences in the cardiovascular responses at the individual isotime (table 2). Treatment with bronchodilators accelerated the central haemodynamic responses at the onset of exercise (t1/2QT= 75.9±10.3 s vs 58.9±18.9 s (p=0.02), t1/2HR= 78.2±13.0 s vs 62.5 ±15.5 s (p=0.03), t1/2SV=51.0±8.1 s vs 40.6±10.3 s (p=0.02) for placebo and bronchodilators, respectively). In relation to the V˙o2 response, there were no significant differences in baseline (unload exercise) and amplitude comparing bronchodilators and placebo (508±147 ml/min vs 528±117 ml/min (p=0.87) and 554±98 ml/min vs 532±108 ml/min (p=0.90)). In contrast, the dynamics of the ‘primary’ component of V˙O2 were significantly faster after bronchodilation (table 3). Bronchodilators slowed the kinetics of leg muscle deoxygenation compared with placebo (figure 1, table 3), despite no significant effects on baseline Δ[HHb] (3±15 μM/cm vs 2±13 μM/cm; p=0.83). Therefore, τΔ[HHb] postbronchodilators was, on average, twofold the postplacebo value (table 3). Consequently, the τ-V˙o2/MRT-Δ[HHb] ratio, an index of impaired microvascular QO2 4 5 decreased after the inhalation of bronchodilators (4.48±1.57 s vs 2.08±1.15 s, for placebo and bronchodilators, respectively; p<0.001). There was a close association between reductions in t1/2QT and lower τ-V˙O2/MRT-Δ[HHb] values after active treatment (r=0.88 (95% CI=0.64 to 0.96); p=0.008). Furthermore, the area under the ‘overshoot’ of the Δ[HHb] response, a pattern of abnormality associated with impaired microvascular QO2 12 decreased (n=3; p=0.04) or disappeared (n=4) after bronchodilator treatment compared with placebo. Comparative effects of inhaled placebo (A) and bronchodilators (B) on changes in deoxyhaemoglobin (Δ[HHb] by near-infrared spectroscopy) in the vastus lateralis in a patient with severe COPD. Note that bronchodilation was associated with slower Δ[HHb] adjustments. These data are consistent with improved microvascular O2 delivery to the peripheral muscles after bronchodilation. TD, time delay; τ, time constant; MRT, mean response time. Interestingly, the decrease in lung hyperinflation (ie, higher IC) was significantly related to faster QT (figure 2A) and V˙o2 kinetics (r=−0.73 (95% CI −0.34 to −0.91); p=0.03) but slower rates of muscle deoxygenation (MRT-[HHb], r=−0.78 (95% CI −0.40 to −0.92); p=0.03). Therefore, patients with larger increases in IC after the inhalation of bronchodilators had greater decrements in τ-V˙o2/MRT-Δ[HHb] (figure 2B). , oxygen uptake; [HHb], deoxyhaemoglobin by near-infrared spectroscopy. The amplitude of Δ[HHb] after the initial ‘fast’ response was significantly reduced with bronchodilators compared with placebo (185±115 μM/cm vs 153±108 μM/cm; p=0.009), remaining lower throughout exercise (figure 3). Δ[HHb] at isotime was significantly related to larger postbronchodilator increases in IC (r=−0.82 (95% CI −0.62 to −0.94); p=0.01) and improvements in Tlim (r=−0.80 (95% CI=−0.54 to −0.92); p=0.01). Leg effort scores at isotime were also lower after active treatment compared with placebo (table 2) and they were marginally related to changes in Tlim (r=−0.53; p=0.08). Effects of inhaled bronchodilators (filled symbols) and placebo (open symbols) on skeletal muscle deoxyhaemoglobin (Δ[HHb], % of maximal value obtained on a previous leg occlusion) in the vastus lateralis at standardised time points during high-intensity exercise. Isotime, the shortest exercise test between the two interventions on a given subject. Values are mean and standard error. This seems to constitute the first study to investigate the effects of inhaled bronchodilators on the determinants of (estimated) microvascular O2 delivery (QO2) and utilisation (phase II pulmonary V˙o2 kinetics) during exercise in patients with COPD. The main novel findings of the present study are that treatment with inhaled bronchodilators to reduce airflow obstruction and lung hyperinflation were associated with: (1) faster on-exercise dynamics of QT and V˙o2; (2) slower kinetics and decreased amplitude of muscle deoxygenation, estimated by Δ[HHb]; and (3) lower leg effort scores. The relationship between lower operating lung volumes after bronchodilators (ie, larger IC) with faster ‘central’ haemodynamic adjustments to exercise (QT) and improved muscle oxygenation (τ-V˙o2/MRT-Δ[HHb]) suggest a mechanistic link between dynamic hyperinflation and impaired QO2 in these patients. Our data, therefore, provide novel evidence that by alleviating the mechanical burden of breathing in patients with COPD pharmacological bronchodilation promotes an enhancement of O2 delivery to the working peripheral muscles. In some specific circumstances, this pattern of response is further complicated by a transient ‘overshoot’ in Δ[HHb],25–27 indicating an increase in fractional O2 extraction above the steady-state level due to impaired phase II blood flow relative to muscle V˙o2.12 Consistent with these assumptions, previous studies found an ‘overshoot’ in Δ[HHb] in patients with type 2 diabetes,25 chronic heart failure19 and COPD.4 The effects of bronchodilators on these complex inter-relationships, however, have not been previously investigated in patients with COPD. Other potential mechanisms for the faster on-exercise dynamics of QT and improved muscle oxygenation are related to the pharmacological properties of the bronchodilators. Although the limited available evidence suggests that inhaled bronchodilators have few haemodynamic effects during exercise in patients with COPD,6 28 their role in modulating skeletal muscle blood flow at the exercise transient in animals is still controversial.31 Additional studies, therefore, are warranted to address this specific issue in patients with COPD. Interestingly, Δ[HHb] remained lower during steady-state exercise after the inhalation of bronchodilators (figure 3) despite no significant increases in QT or Spo2 (table 2). This finding raises the intriguing hypothesis that alleviation of the respiratory muscle work with bronchodilators may have redirected a fraction of the QT from these muscles back to the appendicular muscles. In fact, we previously reported that respiratory muscle unloading by proportional assisted ventilation increased microvascular QO2 at the same QT, suggesting improved perfusion due to blood flow redistribution from respiratory to working peripheral muscles.18 Further studies are needed to apportion the role of lower operating lung volumes and improved muscle oxygenation in enhancing exercise tolerance in patients with COPD. Constant work rate exercise tests at 70–80% peak have been recognised as the most sensitive testing modality to unravel the functional benefits of bronchodilators.32 However, our findings may not be relevant to milder exercise intensities where lower ventilatory requirements may decrease, or even abolish, the beneficial effects of bronchodilators on muscle deoxygenation. We also recognise that the use of cycling instead of walking may have contributed to magnify the positive effects of bronchodilation on exercise tolerance, as contractile fatigue33 and the sense of leg effort34 are more relevant contributors to decrease exercise capacity in the former modality. It should also be acknowledged that our non-hypercapnic patients with advanced COPD were severely hyperinflated and they presented with substantial reductions in DLCO (table 1)—that is, a disease profile more compatible with the emphysematous subtype. Consequently, our results should be cautiously extrapolated to other COPD phenotypes. Finally, most of the correlation coefficients had wide confidence intervals, a likely consequence of the small sample size. Therefore, it is advisable that these specific results be confirmed in larger studies. The present study showed that administration of inhaled short-acting bronchodilators to reduce lung hyperinflation slowed the dynamics and reduced the amplitude of muscle deoxygenation during high-intensity cycling exercise in patients with moderate to severe COPD. Considering that these findings were associated with faster on-exercise kinetics of QT and the ‘metabolic’ phase of pulmonary V˙o2, our data are consistent with a speeding and heightening of O2 delivery to skeletal muscles of patients with COPD treated with inhaled bronchodilators. The authors would like to thank all colleagues from the Pulmonary Function and Clinical Exercise Physiology Unit (Division of Respiratory Diseases, Federal University of Sao Paulo (UNIFESP), Brazil) for their friendly collaboration. More importantly, however, they are indebted to the patients for their effort and enthusiastic cooperation throughout the study.
. The major limitation to exercise performance in COPD is inadequate energy supply to the respiratory and locomotor muscles. J Appl Physiol 2008;105:749–51.
. The major limitation to exercise performance in COPD is lower limb muscle dysfunction. J Appl Physiol 2008;105:751–3.
. The major limitation to exercise performance in COPD is dynamic hyperinflation. J Appl Physiol 2008;105:753–7555.
. Kinetics of muscle deoxygenation are accelerated at the onset of heavy-intensity exercise in patients with COPD: relationship to central cardiovascular dynamics. J Appl Physiol 2008;104:1341–50.
. Heliox improves oxygen delivery and utilization during dynamic exercise in patients with COPD. Am J Respir Crit Care Med 2009;179:1004–10.
. Effects of inhaled bronchodilators on pulmonary hemodynamics at rest and during exercise in patients with COPD. Chest 1999;115:376–82.
. Pharmacologic interventions in chronic obstructive pulmonary disease: bronchodilators. Proc Am Thorac Soc 2007;4:526–34.
. Reference values for lung function tests. I. Static volumes. Braz J Med Biol Res 1999;32:703–17.
. Reference values for lung function tests. III. Carbon monoxide diffusing capacity (transfer factor). Braz J Med Biol Res 1999;32:729–37.
. Measurement of symptoms, lung hyperinflation, and endurance during exercise in chronic obstructive pulmonary disease. Am J Respir Crit Care Med 1998;158:1557–65.
. Dynamics of muscle microcirculatory oxygen exchange. Med Sci Sports Exerc 2005;37:1559–66.
. Muscle capillary blood flow kinetics estimated from pulmonary O2 uptake and near-infrared spectroscopy. J Appl Physiol 2005;98:1820–8.
. A new impedance cardiograph device for the non-invasive evaluation of cardiac output at rest and during exercise: comparison with the “direct” Fick method. Eur J Appl Physiol 2000;82:313–20.
. Does thoracic bioimpedance accurately determines cardiac output in COPD patients during maximal or intermittent exercise? Chest 2005;127:1122–31.
. Evaluation of two methods for continuous cardiac output assessment during exercise in chronic heart failure patients. J Appl Physiol 2008;105:1822–9.
. Parameters of ventilatory and gas exchange dynamics during exercise. J Appl Physiol 1982;52:1506–13.
. Control of oxygen uptake during exercise. Med Sci Sports Exerc 2008;40:462–74.
. Respiratory muscle unloading improves leg muscle oxygenation during exercise in patients with COPD. Thorax 2008;63:910–15.
. Microvascular oxygen delivery-to-utilization mismatch at the onset of heavy intensity exercise in optimally-treated patients with CHF. Am J Physiol Heart Circ Physiol 2009;297:H1720–8.
. Prediction of metabolic and cardiopulmonary responses to maximum cycle ergometry: a randomised study. Eur Respir J 1999;14:1304–13.
. Interpretative strategies for lung function tests. Eur Respir J 2005;26:948–68.
. 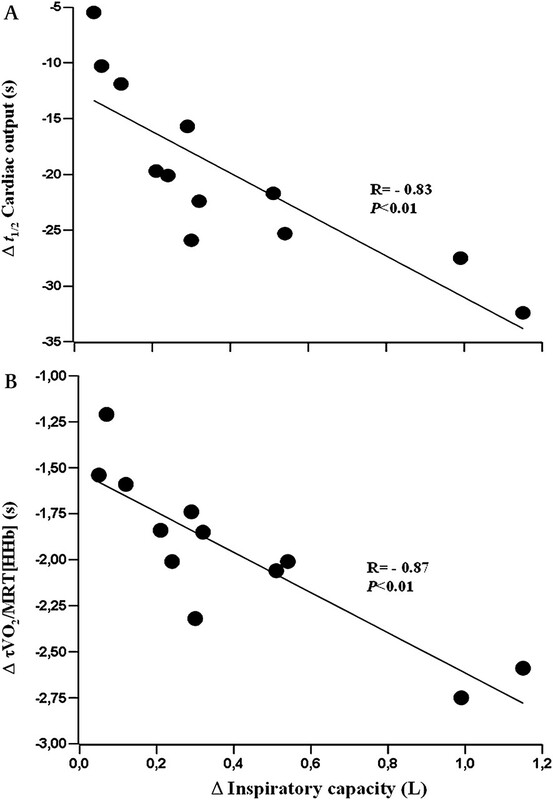 Faster adjustment of O2 delivery does not affect VO2 on-kinetics in isolated in situ canine muscle. J Appl Physiol 1998;85:1394–403.
. Muscle blood flow–O2 uptake interaction and their relation to on-exercise dynamic of O2 exchange. Respir Physiol Neurobiol 2005;147:91–103.
. Exercise hyperaemia: magnitude and aspects on regulation in humans. J Physiol 2007;583:819–23.
. Skeletal muscle deoxygenation after the onset of moderate exercise suggests slowed microvascular blood flow kinetics in type 2 diabetes. Diabetes Care 2007;30:2880–5.
. Autonomic origin of heart rate fluctuations at the onset of muscular exercise. J Appl Physiol 1976;40:679–82.
. Cholinergic and neurogenic mechanisms in obstructive airways disease. Am J Med 1986;81:93–102.
. 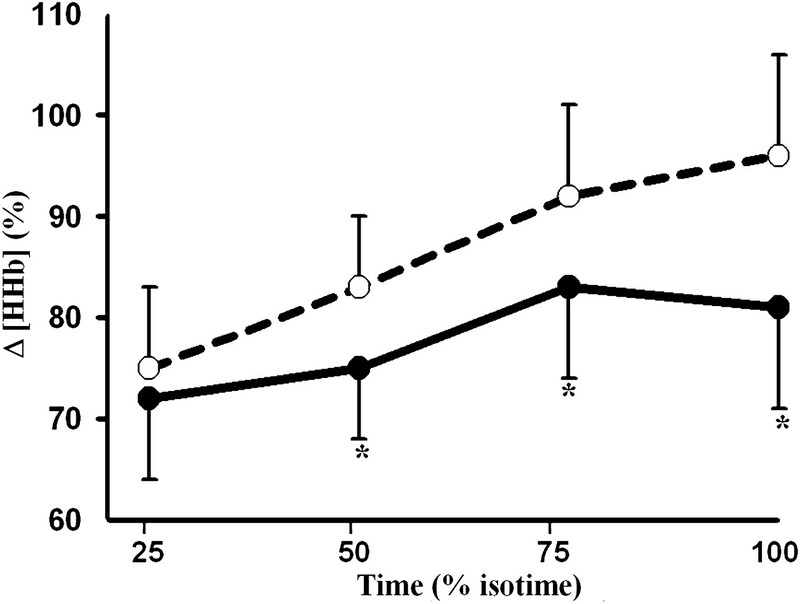 Effects of ipratropium bromide and fenoterol aerosols on exercise tolerance. Eur J Respir Dis 1984;65:441–6.
. Effect of intrathoracic pressure on left ventricular performance. N Engl J Med 1979;301:453–9.
. Bronchodilator effect on ventilatory, pulmonary gas exchange, and heart rate kinetics during high-intensity exercise in COPD. Eur J Appl Physiol 2009;107:633–43.
. Autonomic control of skeletal muscle blood flow at the onset of exercise. Am J Physiol Heart Circ Physiol 1999;277:H1872–7.
. Factors determining constant work rate exercise tolerance in COPD and their role in dictating the minimal clinically important difference in response to interventions. COPD 2005;2:131–6.
. Contractile leg fatigue after cycle exercise: a factor limiting exercise in patients with chronic obstructive pulmonary disease. Am J Respir Crit Care Med 2003;15:425–30.
. Walking versus cycling: sensitivity to bronchodilation in chronic obstructive pulmonary disease. Am J Respir Crit Care Med 2005;172:1517–22. Funding DCB was suppported by a Doctoral Research Fellowship from Coordenadoria de Aperfeiçoamento do Pessoal de Nível Superior (CAPES), Brazil. GRC was suppported by a Postdoctoral Research Fellowship from Fundação de Amparo à Pesquisa do Estado de São Paulo (FAPESP), Brazil. JAN is an Investigator of the Conselho Nacional de Desenvolvimento Científico e Tecnológico (CNPq), Brazil. The study was supported by a Research Grant from FAPESP, Brazil. Ethics approval This study was conducted with the approval of the Institutional Medical Ethics Committee.